Josh, Matthew and Theo, who all attend St Marys in Dunblane win the Under 11s category. The boys created Woodland Crafts and with the help of their families, sourced horseshoes (kindly donated by Will Forbes) and decorated them to sell, learned to make candles and made some gorgeous candles to sell alongside homemade baking at a stall at their school. Local shop Unique agreed to sell their products and The Salem Wicks helped the boys with their candle making too. The boys also kindly donated one of their Christmas candles to our Christmas hamper that we will be raffling off shortly. Aaaaaand Madeleine Byrne wins the 11 and over category. Madeleine illustrated her own comic inspired by her role in the schools summer show. With the help of her dad, she made copies and sold them at each performance. She generously donated all her proceeds to Start Up Stirling. We were all blown away by her thoughtfulness and this was, in fact, the inspiration for the competition. She set the bar very high for creativity, kindness and supporting Start Up Stirling. Yet again we see an amazing idea supported by family, community and St Marys Primary School. We also loved Peter Owens fundraising initiative. Peter won a competition at St Mary’s Primary School Dunblane to design a new Dunblane pop up card. He has been selling these online and for each card he sells, he donates £1 to Start Up Stirling. Not only is the design amazing, but we love the wonderful thoughtful gesture by Peter. So we have decided that Peter is our Runner Up. Well done from all of us at Start Up Stirling and huge thanks for choosing to support Start Up Stirling. 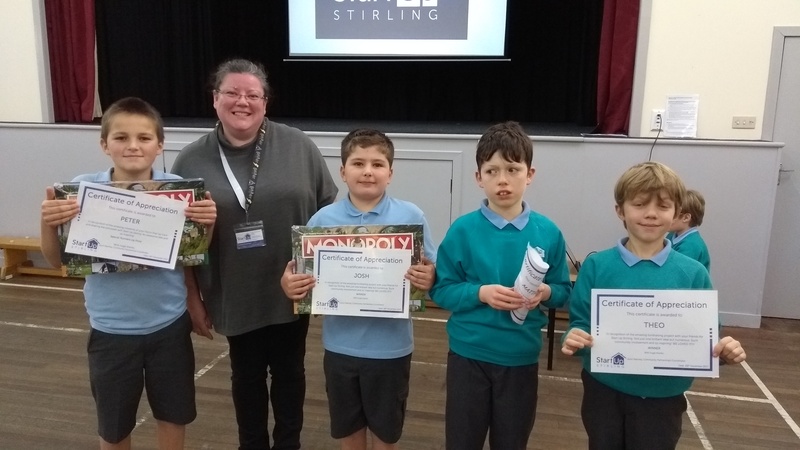 Laura met these wonderful boys at St.Mary's Episcopal Primary School in Dunblane to present them with their prizes. It was an absolute delight to meet Josh, Theo, Matthew and Peter. Such an inspirational group of children - we love their passion, ideas and commitment to helping others. And huge thanks to Toy Hub UK and Stirling's Festival of Volunteering for supporting us with prizes.